Information on the health risks of continued smoking and of second hand smoke along with the benefits of quitting. Unlimited counseling, and feedback from Quit Coaches trained to assist in the quitting process. 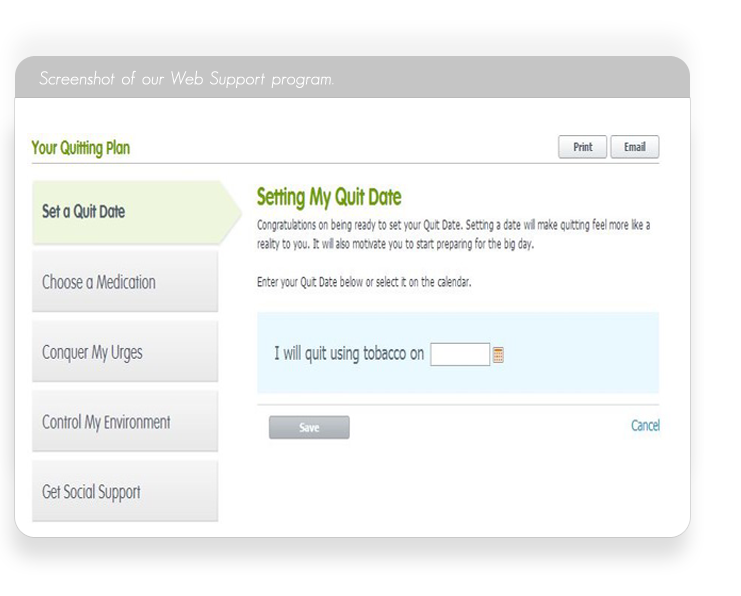 Personalized smoking cessation plans for each registered participant. Ability to order a free twelve week supply of Nicotine Replacement Therapy online. (Eligible registered participants 18 and older). Access to local resources like classes, that provide additional tobacco cessation support. Call 1 800.QUITNOW (800.784.8669) to talk to a live Quit Coach 24 hours a day, seven days a week. Counseling is provided in English, Spanish, or other languages.